New England and New York had the highest temperature departures from normal during July. 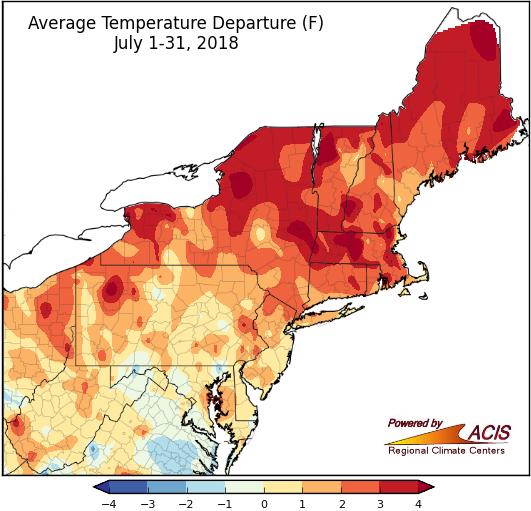 The heat wave that kicked off the week of the Fourth of July set the tone for a warmer-than-normal month for much of the Northeast. New York and New England experienced the highest temperature departures from normal in the region. This July ranked among the 20 warmest on record for 18 of the 35 major climate sites in the Northeast. Areas towards the southern part of the region recorded temperatures that were near normal for July, and all but one major climate site in the region (Dulles Airport, VA) experienced warmer-than-normal temperatures on average this month. 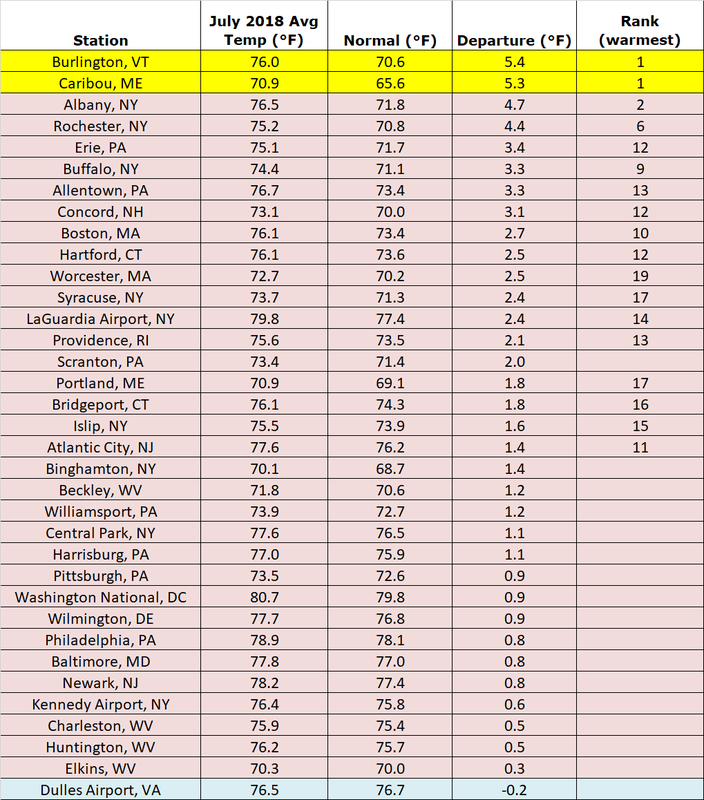 Temperature departures from normal ranged from 0.2˚F below normal at Dulles Airport, VA to 5.4˚F above normal in Burlington, VT.
Caribou, ME and Burlington, VT each experienced their warmest July on record, as well as their warmest months ever recorded. Both locations had temperature departures that were over 5˚F above normal. Prior to this July, the warmest month for Caribou had been July of 1970 and the warmest month in Burlington had been the same month in 1921. Burlington also set another record by having 21 days throughout the month where the temperature was above 85˚F, beating the previous record of 20 days which was set during the same month in 1975. Precipitation throughout the region was wide-ranging this month, with the highest rainfall totals seen in Maryland and Pennsylvania. 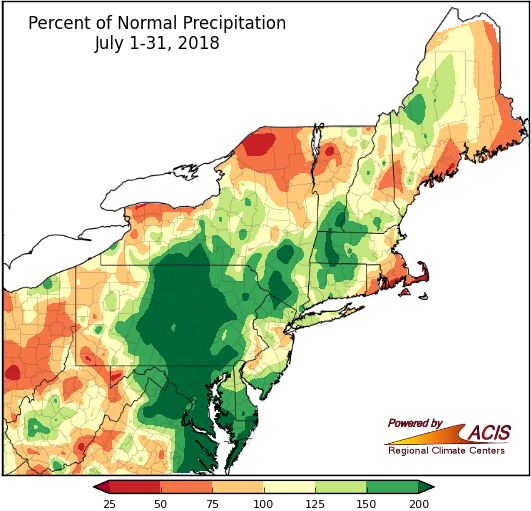 Precipitation amounts varied greatly throughout the Northeast during this past month and flip-flopped in some parts of the region. Washington National, DC recorded no measurable precipitation during the entire first half of July, but later received over nine inches of rain during the span of nine days, which led to flooding in some areas of the Mid-Atlantic. Baltimore, MD received a record 16.73 inches of rain, or 411% of normal precipitation, for the month of July, after enduring many heavy rainfall events over the past few months. 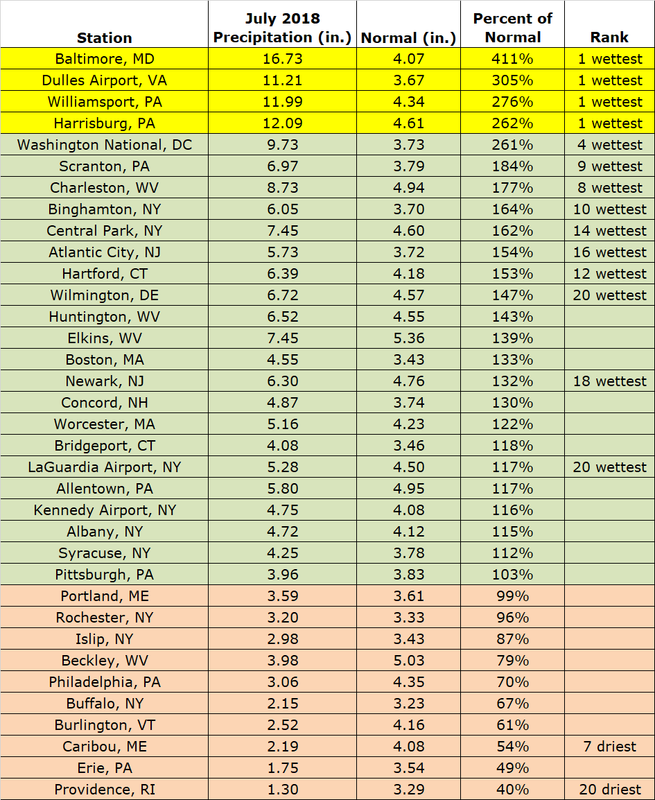 Other locations that experienced their wettest July on record include Williamsport, PA, Harrisburg, PA, and Dulles Airport, VA. This July was among the 20 wettest on record for 14 of the major climate sites in the region. Although some areas had days of heavy rain, other parts of the region experienced evolving drought conditions. By the end of July, moderate drought had spread throughout portions of northern New England and northern New York. Caribou, ME recorded its seventh driest July on record. Abnormal dryness also started to encompass Long Island, NY but eased in parts of central New York, Connecticut, and Massachusetts. This past July was drier than normal for 10 of the major climate sites in the region. Comparing the beginning of July to the end of the month, drought conditions improved in some portions of the region.